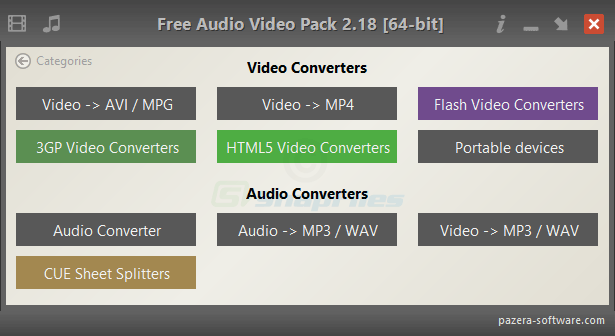 Any Video Converter (Free version) enables you to convert between a wide range of video formats including AVI, FLV, MOV, MP4, MPG, M2TS, MTS, RM, RMVB, QT, WMV and others. The program offers ready-to-use conversion profiles... Offers to install promotional, third party software. DivX for Windows includes the codec and player that enables you to watch movies that were optimized with DivX compression technology. This download provides you with everything you need to play DiVX files for free. DivX for... Offers to install promotional, third party software. 500th Video Converter is an easy to use software that enables you to convert your video files between different formats, extract audio soundtracks and burn videos to DVD. The program can convert most popular video formats to... Offers to install promotional, third party software. Pazera Free Video to Flash Converter enables you to convert video files (AVI, MPEG, MP4, 3GP, MOV, MP3, WAV, WMA and others) into streaming Flash Video format (FLV, SWF) format. The program comes with several predefined... Offers to install promotional, third party software. Looking for more choices? There are 21 more downloads in our Video Converters (Shareware) category.